Many you have probably considered carpooling. You should have heard of TravelSmart by now so you know you can save lots of money, reduce emissions, which helps to improve both human health and environmental conditions, all while continuing to park in the same lot you park in now (or a better lot, depending on your carpool partner). Did I mention you can park for free?? So why aren’t you carpooling? Do you need help finding somebody who works on this campus, lives close to you, and works approximately the same hours? Zimride is the free program that can help match you with a carpool partner from this campus. You aren’t signing up to carpool (committing to anything) by logging on or posting a ride. If you post a ride between August 9th, and September 9th you will be automatically entered to win one of two $50 Amazon gift cards! All you have to do is post a ride and leave it up until at least September 9th. 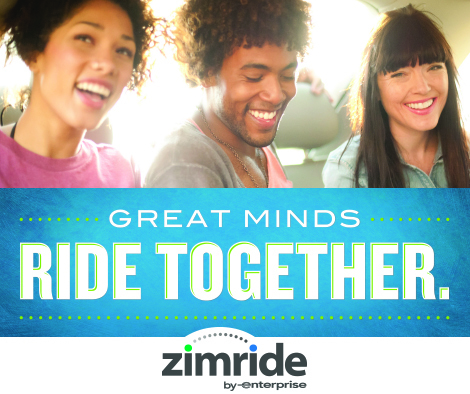 Zimride will randomly select new posts to win a prepaid gift card. Already on Zimride? Check your ride to make sure all your details are correct. You can also change the size of the area you are looking to match. For people who live out of town or farther away, expanding your zone will get you more matches and even if you have to drive part way to meet your partner, you still save money and resources on the rest of the trip and get free parking on campus. Don’t forget to check your matches! On average, people who post a ride will see 10 other people that they could carpool with. Contact them to see if it will work for both of you. So what are you waiting for? Go post a ride and see if you win can win a prize! Then save more cash by giving carpooling a try. Questions on TravelSmart, carpooling, or this contest? Email us and we are happy to help. Next Next post: Where’s the water go?